The time horizon is 9 years plus, so I’m not sure what parts will eventually get built and when. Funding is also an issue. Any proposal that makes it more difficult, or longer, for Frankston line passengers to get to/from MURL stations (Parliament, Melb Central, Flagstaff) will not get my support at the November election. It is twin tunnels. There is 2 extra freight lines. Inner city train stations look at the city loop and other stations in the city they all have 4 stations or more. Hopefully what I have read is correct that there will be 4 tracks included in the tunnel like the city loop and four They then need to quadruple the Box Hill line. John, I think you’re assuming each line on the map is a pair of tracks. The PTV web site specifically says “twin tunnels from Southern Cross to South Yarra”. 2, not 4. I would say it is 2 tracks per tunnel. But I could be incorrect. The other question is where do driver changeovers and such happen? Usually they happen at Flinders Street, but seeing as these lines don’t stop there. Will the drivers have to run all the way from Frankston to Belgrave/Lilidale? Hmmm….an interchange station at South Yarra? Obviously, highly desirable, but to my inexpert eye, the physical realities at South Yarra would seem to make this particular aspect a complex (= expensive) construction project. If the project ever happens (and, to my mind, that’s a massive “if”), there might be a big temptation to save a heap of $$$ and just quietly drop the South Yarra interchange. I can see it now: “Frankston line passengers who want to go to Flinders St have lots of other options: change at Caulfield, take a tram from Domain, back-track from Southern Cross…..” etc. Also one other point. You cannot have twin platform inner city stations it does not allow for the future. Look at the freeways they build them with 6 lanes. This tunnel needs to be 4 tracks. They have six platforms at South Yarra. Montague is even more inner city Domain is inner city with larger high rises.. I would disagree that 2 platforms can support the amount of people using these stations. What are you talking about John Doe? Your logic doesn’t make sense. Haven’t heard much commentary on the fact that this plan will fundamentally make Southern Cross Melbourne’s main station. In my view this is a good move – it’s central to the western CBD and Docklands, has much better passenger amenity than Flinders Street, and connects with regional services. I still remain doubtful of the value the airport line will deliver, especially when travel times will be comparable to the existing Skybus service. Arguably it will be a more expensive service to deliver as well, especially if a similar frequency is planned. Although this proposal has the merit of separating all of the various suburban lines onto their own alignments it still doesn’t deal with the congestion on north south routes through the city. This merely delays a decision on digging up Swanston st, whilst simultaneously undermining the business case for a rail tunnel. The city is going to have to bite the bullet at some point and put a tunnel under Swanston or Elizabeth st, (presumably elizbeth st would be more expensive as it would have to be deeper to safely clear the foundations of buildings on the south bank). I can’t see the benefit-cost ratio of this scheme being better than the original one and the disruption will surely be shifted from south-east suburbs tram riders to city loop passengers. Also nothing for the north-eastern suburbs at all, at least the old proposal held out the prospect of maybe one day separating the South Morang and Hurstbridge lines. i guess we’ll see if these plans last through the end of the year. There are more losers than winners from the redesign. West and North Melbourne the obvious casualties. The Metro link through Footscray, Arden Macaulay, City North, Melb Central, Flinders St and Domain would have delivered a much greater benefit in ‘balancing’ the city, opening jobs access for people in the West, catalysing inner north west CBD infill, etc… Eddington had good reasons for that alignment. And the City of Melb and DoP have based land use planning around it ever since. I’m keen to see a map of the walkability of ‘Montague Station’, and development potential of its immediate surrounds. At a glance, the Freeway to its north and heritage parts of Port & South Melb to its east and south will seriously restrict potential yield. The main earlier proposal that springs to mind would have involved turning the Northern + Burnley underground loops into a Northern-Burnley twin tunnel route. So the Burnley would need significant extra tunnel to take it toward North Melbourne, and the Northern significant extra tunnel to take it toward Richmond. With this proposal, the cut-and-cover tunnels just need to be rearranged slightly to get the track pairs to come out in the right place at Richmond Junction and Southern Cross. They’d probably only need to move the Burnley to Platform 11 at Southern Cross, and to bring the Caulfield tunnel to the surface right where the Burnley currently surfaces (I understand that they run parallel at that point). @Ed & Stuart – You seem to ignore that this plan frees up a lot of capacity on the Southern Cross Flinders Street viaduct, and through-routes four of the lines currently going through North Melbourne to the South Eastern part of the city. I don’t think it is fair to say it doesn’t address congestion/add capacity on those lines. True it means a lot of passengers on those lines will have to change trains at Southern Cross or Flinders, but realistically this has to be an outcome with any capacity building projects in the CBD. For example, Cragieburn/Upfield now will no longer share tunnel space with Sunbury, because Sunbury will be through routed to Pakenham and Cranbourne. @Julian. good point – it brings benefits for ‘untangling’ the network. No doubt helpful in running lines independently, avoiding knock on effects, etc. And no doubt helps other lines do more heavy lifting. My main concern is the apparent lack of consideration for land use. Montague is not Fishermans Bend. A station in this location cannot be pegged to ‘serving a new urban precinct’ unless it’s immediate surrounds can provide significant jobs and dwellings. Doubtful given infrastructure in the area.. But I’m speculating, given no map with ‘station here’ on it.. The amount of work that went in to the Metro alignment was huge, and proved big wins; effective jobs density of inner north, massive boost for Footscray, housing in Arden Mac, serving hospital, uni & employment in City North, etc. If similar pros have been assessed for Melb Rail Link, need to see them. Very vague and confused argument from Libs so far on this new idea – looks like bad planning. Two lines going to Southern Cross Station. Then they should have another two lines going underground from Flinders Street station. This would trains to circle the loop and rejoin back through this tunnel. And why not add a station in the heart of South Melbourne? There’s a big distance between Montague and Domain. I have mixed feelings as well, but with 830 million committed it sounds like it will happen but i want to look at the budget papers in more detail to see where the money is coming from, after four years from now, I am surprised that, if we are talking about post 2025 they are not including the melton electrification. I think this will come in even earlier cause the demand will be overwelming. Any way I’m more happy with the Dandenong/Pakenham upgrade cause ‘we’ve’ always said you can get more capacity if you get modern signaling and other improvements (despite the outrageous way the govt gives over its planning to the private sector and the subsequent cost). Regardless of whether it is better than the now-abandoned network plan, this plan would be improved by the outright deletion of Montague. All it does is add a stop and reduce the line speed between Domain and Southern Cross. According to the map Julian links to above @4:42pm, the Collins St. tram will cross the river and run down Plummer St. You could easily add a branch down Ingles to get to Montague. So to access it, get a train to Southern Cross and catch one of two westbound routes on Collins St. Easy, and could be built years sooner too. @Kurt: South Melbourne around Moray/York/Clarendon is mostly low-rise, and largely residential and heritage-protected. There is little further scope for development and no need for heavy rail. First the plusses: 1. It brings forward breaking the Flinders Street hegemony which has limited thinking for far too long already. Networks do not need a single choke point. (Westgate isn’t one either as many of us have pointed out the numerous other Maribyrnong crossings.) The fact that this will increase the swing away from the Libs on the Frankston line is just a bonus. I won’t go over the problems of trying to unplan the Parkville route which others have said plenty about, but concentrate on the problems for the SSW corridor, Hobsons Bay, Wyndham and Geelong, which prompted me to Tweet earlier. What the Libs can’t face up to is that Labor really has locked in a broad arc of growth areas in the N and W from Whittlesea to Wyndham, plus an even more remote patch in the far SE served only by the Dandenong corridor. Consequently Melbourne’s worst congestion problems are from the rapidly growing ends of that arc, Whittlesea, whose side traffic is entirely responsible for any extra inner E-W congestion, and Wyndham as was amply demonstrated by the recent race to the CBD in which the car drivers were tailed off a bad last. Yes, there certainly is a need to reduce delays on M1 west. Only massively improved public transport will do that, not a new tollway designed to get people across rather than into central areas. The road needs out west are not more radials. Where is the equivalent of Warrigul and Springvale Roads, or of Bell Street? There is one on a slow fuse at VicRoads, the Palmers Road alignment from Point Cook to Calder Park which would add the kind of flexibility and bus routes that would make some real inroads on the radial overloading. Until we get serious about such projects, Geelong and the G21 region will remain stuck on the wrong side of inescapable congestions inbound from Werribee, on the M1 and, save for some temporary respite with RRL, on rail as well. Imagining that the Werribee, Altona-Laverton and Williamstown lines can together be squashed down to Sandringham line capacity just compounds the problem. When I was a kid Broady and Sandy were a well matched and well used pair. Somewhere along the line it might be good to settle on some truly permanent through alignments which can underpin development of cross town affiliations, ones that make more sense than Frankston to Ringwood. While it too may cost a few more votes, I wouldn’t worry too much about Frankston line passengers having to stay on around the loop to get to the MCG via Richmond or Parliament. Northern loop passengers have a similar problem now with Ethiad, though we do have the bonus of a quick trip home. When you consider Eddington’s deplorable track record this century, any plan other than his, is probably a better bet. It seems to be a failing of this plan, that although there are three different routes passing through south yarra, none of them goes directly to parliament and melbourne central. If I was going to implement a scheme like this, and there was going to be three (bidirectional) lines going through south yarra, I’d run one more or less directly to southern cross, another more or less directly to flinders street, and the third one more or less directly to parliament and melbourne central. That makes changing trains actually a useful concept. Running trains the long way round is always annoying. The other thing I would say, is that there is a lot of potential cross-city traffic which is often overlooked and often contributes more to congestion in the inner-city area, than traffic with an actual destination in the CBD does. A (more or less) direct train from say Caulfield to Footscray is a useful cross-city option. A service from Caulfield to Camberwell via the city, less so. Daniel, I just read that article by Alan Davies, and one of the most interesting things that he says, is that this latest scheme will increase capacity by 30% compared to the Eddington scheme’s 17%. I thought about this for a while, and made some diagrams of my own. It’s hard to see how this scheme is twice as good as the other scheme in that respect. Particularly, the new scheme actually delivers zero additional tracks in the CBD proper, whereas the Eddington scheme has an entirely new and separate track pair crossing the CBD. How do they get these numbers ? Do they just make them up ? This is my plan. Notice how the Sandringham line loops around. But you would need 4 tracks for this to works correctly. The Melborne Rail Link is a disaster for Frankston Line travellers. It’s problem is the removal of access to key CBD and fringe stations on the side of the city from which it comes. Taking away direct access to Richmond, Flinders and Parliament, and instead putting these on the outbound journey (to Ringwood) is madness. Direct access to Flinders is lost altogether. Some people will say the answer is easy: change trains, or just stay on the train and you’ll eventually get where you want to go. I’m ok with changing trains – I do it every day at Richmond already. But for journeys to underground loop stations, this will become 2 changes – once at South Yarra, and again at Richmond. Surely this is unnecessary in Melbourne? How many people travelling today have to make 2 train changes, and are happy about it? How many delays do you experience from just-missed connections? Why spend billions to make this problem even more prevalent on Melbourne’s rail network? So what about the option to just stay on the train and do the Great Big Loop? To travel to Parliament, this option will add 5 stations and up to 20 minutes to the journey. Traveling in from Frankston, this is a 30% increase in journey length. For those travelling in from closer stations, the impost will be proportionately bigger. Who in their right mind would spend billions on new rail line that increases travel time by 30% of more? My final beef is the impact on people travelling to/from the Yarra Park and Melbourne Park sporting and entertainment facilities: MCG, AAMI Park, Olympic Park, Tennis Centre. Many thousands (full trainloads) do this regularly, using the conveniently located Richmond or Flinders Street stations. After MRL, Frankston line travellers wishing to go to an event via Richmond Station – will either have to change at South Yarra, or travel the loop. Changing a fully loaded train at South Yarra will be physically impossible, because full train-loads of travellers also use the Dandenong line to get to the game. You can’t fit 2 train-loads into 1 train (god knows Metro has tried and failed a few times recently). So a full Frankston train-load of passengers destined for Richmond stays on, travels the loop, and 20 minutes later they finally get to Richmond. Bad luck to anyone who actually wanted to board that service at Domain, Montague, Southern Cross, Flagstaff, Melbourne Central or Parliament. Mark my words: Frankston line travellers are going to despise the new MRL diversion. @Ed, not sure how you mean it’ll separate all the lines, but not deal with the congestion. In terms of trains (NOT passengers), separating the lines does achieve that. The government are claiming the total cost of this new tunnel alignment plus airport rail = the total cost of the old tunnel alignment alone. But there’s no detail on how they came to that conclusion. This new plan doesn’t rule out the eventual connection of South Morang/Mernda to another tunnel, as was proposed eventually. But it might make it more difficult to run it under Southern Cross if there are existing underground platforms there. @Evan, I’d imagine they’d have the Frankston to Burnley tunnel platforms underground at Southern Cross, as they’d need the platforms vacated by these to through-route Sunshine to Dandenong and Newport to Sandringham on the surface. @Kurt, I kind of agree; somewhere around Clarendon Street might make sense, noting that it would add (again) to travel time from Frankston. Yeah comparing Etihad vs MCG… the issue would be Frankston line people will have a roundabout ride in both directions. They could jump on board a Dandenong train and change at South Yarra or Caulfield, but that would mean extra pressure on that line during big events. Forcing Pakenham/Dandenong/Cranbourne line passengers to change to get to Flinders St is not going to go down well. It’s bad enough now. Might have to start getting the tram to the city instead now. @Tim, no, have another look at the map please. All very intetesting Daniel! I wonder if it will get built as planned here or if the plans will be modified over time to conform to new governments, additional promises from officials, revised budgets and cost overruns, etc. No matter how it’s built some people will not be happy with the end result especially if they have to change their commute by changing trains or going through the loop when they had a more direct route before. These people will get over it eventually and the new commute will be a new normal for them. If some rail congestion is cleared up they might not have a much longer commute timewise even if they do have to travel farther distance wise. I’m glad they’re planning to build a rail route to the airport. While perhaps this route is not the best one with the quickest time to the airport it is still a better option (at least in my opinion) than having to catch a bus to the airport from Southern Cross and 1 train can move several busloads of passengers too. Those wanting a quicker trip to the airport from Southern Cross can still catch a bus or taxi to the airport if they feel the need to. The proposal is to connect the Burnley and Caulfield loops to make a through city track pair from Ringwood to Frankston. 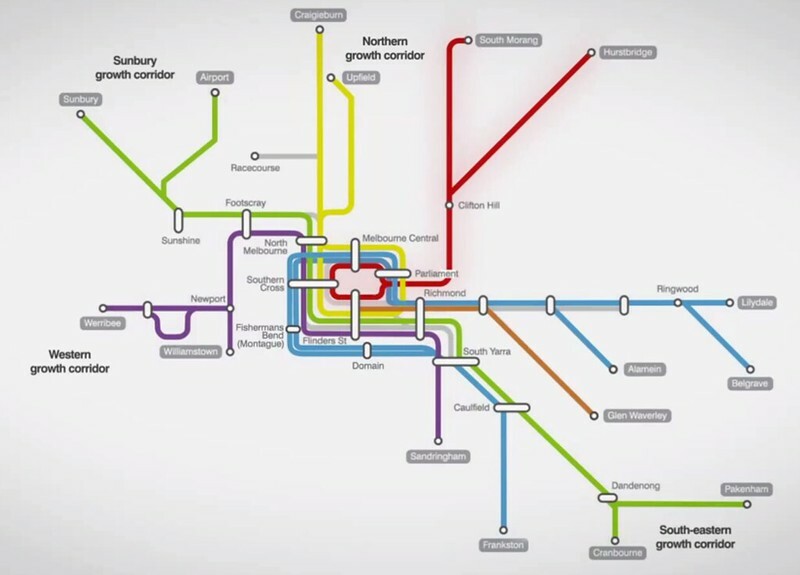 The concept is similar to earlier proposals to connect the Burnley and Northern loops  or the Northern and Caulfield loops . 2. connect the Northern and Caulfield loops to make a track pair from Craigieburn to Frankston via Melbourne Central. This needs about 2-3 track kilometres of new tunnel for new chords from Parliament to Richmond and Flagstaff to Nth Melbourne. Compare with 15 track km and four underground stations for the Fishermans Bend proposal. * better options for east-west through-city trips, including more one seat travel on the three through city track pairs. This is important in light of future Arden and Egate developments. * better connections at Richmond and Nth Melbourne, where all three through-city track pairs pass; this minimises issues like the complaint that the present proposal gives very poor access from the Frankston line to Parliament. – Glen Waverley/ Alamein/ Blackburn has more patronage than Sandringham, so the advantage of through routing for cross city trips will be enjoyed by more people. – Werribee and Sandringham demand would be unbalanced. This implies either running a lot of empty seats to Sandringham, or terminating some Werribee trains at Flinders St, which undermines the operational simplicity of through-routing.- By contrast, Sunbury and Glen Waverley/ Alamein/ Blackburn demand is more balanced, and there is the opportunity to use some of the capacity to increase service on the Ringwood line when needed. So the new proposal, to be justified at all, would have to be justified by reference to an integrated development plan for Fishermans Bend. It’s not justified as a project to increase rail capacity, because that can be done better and more cheaply in other ways. proposed for ‘stage 4’ (ie in the never-never) in PTV’s 2012 Network Development Plan. To avoid conflict with Frankston trains this requires up-up-down-down running to Caulfield with a new flyover at Caulfield. How this increases capacity: it frees up two loop tracks on the Flinders St viaduct, and these are used for the Sunbury line, thus bypassing the present choke point where Sunbury and Craigieburn merge to the Northern loop. Everything I have read on the north-south route including a Parkville station seems to assume that it cannot be built without digging up Swanston St. The original tunnels were built using tunneling machines, not by trenching. Why not again??? The medical/educational district around Parkville/Carlton is the intellectual, scientific and creative heart of the metropolitan area, and is already so totally saturated with automotive traffic that it is virtually impossible to find a place to park within a km of the hospitals or university after around 9:30. With new institutions such as expansions to Children’s Hospital, Royal Melbourne, new Cancer Centre, the Peter Doherty Centre (to name a few currently under construction or just finished) the situation will only get worse. Staff and students already saturate the existing trams and shuttle bus services between the existing rail services and the precinct. At peak times Swanston St University Stop trams towards the CBD fill as fast as they physically can to standing room only. Similarly the 201 Shuttle buses from N Melbourne Station fill to full standing-room capacity and contribute substantially to the total traffic congestion on Grattan St. There are many advantages from cross fertilization and economies to concentrating the health and education institutions in the one area – but access to staff, students and patients is quickly reaching the point that further expansion will be strangled. The importance of this area to the national economy should also be considered – especially from the foreign exchange generated by the tens of thousands of foreign students using the facilities that have to commute from cheaper rent districts. This connection is far more important to the economic, social, health, and cultural aspects of Greater Melbourne than would be one or two stops in South Melbourne, Fishermen’s Bend, etc. that can easily be serviced by light rail. Finally, to reiterate, the idea that servicing the University/Medical district requires digging up the length of Swanston St is hogwash. There were no streets dug up for years to accommodate the original tunnels and there is no need to do it now. Perhaps it would cost more than trenching, but probably not after factoring in the economic disruption that trenching would require.